This little vessel was commissioned as a viable replacement for the traditional open wooden fishing boats used on Lake Malawi. Depletion of the indiginous timber stocks had forced a rethink on the construction material but construction had also to be economical. 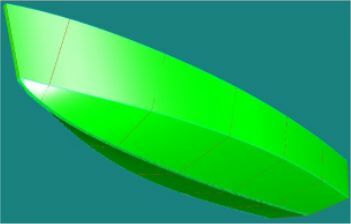 A hard chine hull form was chosen for ease of building in metal. Steel was the material chosen by the builder but she can be built from aluminum as well. Economy of construction is achieved by plating hulls over a spaceframe, giving a fast turn-around. 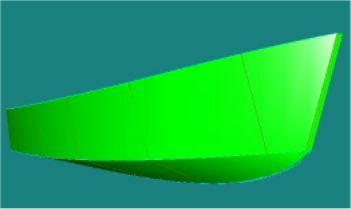 Three permanent frames are set up as part of the spaceframe, onto which the longitudinals are fitted then the hull plating. A Plywood wet deck and plywood seating are bonded to the steel structure, allowing access throughout the hull for proper painting prior to fitting the timberwork. This also allows the entire deck to be removed for proper repainting of the hull when that time comes, without concern about what may be happening in inaccessible corners that would be hidden under a steel deck. The spaceframe method of construction will permit her to be built in larger sizes as well. Length is increased by spacing the frames further apart. A centreline flat over the full length of the hull permits beam to be varied by changing the width of the flat. 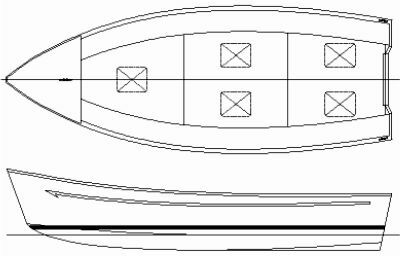 These features make her a versatile boat for a professional builder to be able to offer a range of boats from one basic design. Powering for Lake Malawi is intended to be 20hp outboard for economy of operation in no great hurry. For those needing more speed, she can safely be fitted with an 80hp outboard. The hull has a planing form but it was drawn to be relatively efficient over a range of moderate speeds rather than at high speed. This also makes it more efficient for carrying loads at low to moderate speeds. Although drawn for steel,she could be built in aluminium as well, at increased construction cost but reduced operating cost. She is well suited to fishing, diving and ferry service in a wide range of sea conditions. We offer optional full size patterns of frames and hull skin panels. This design can still be built from plans only, with the builder drawing the frames from offsets and dimensions on the drawings. For those who prefer to bypass that step, we can supply the patterns on paper or on more stable Mylar. Both are printed in 914mm (36") wide strips on our CAD plotter and supplied ready for transfer onto building boards on which you will construct the frames, or directly onto the material from which the hull skin panels will be cut. The choice is yours. Click here to view a material list or list of drawings for this design. This design has both Imperial and Metric measurements.